Through a series of fun and innovative pop-up events, PEM is growing a new creative community. Our latest venture outside the museum took us to a Boston co-work space that fosters creativity. The Village Works in Brookline Village was recently featured in The Boston Globe. By partnering with the co-work space, PEM reached their membership and participants, many of whom work for startups, innovative small businesses or primarily work from home on entrepreneurial endeavors. 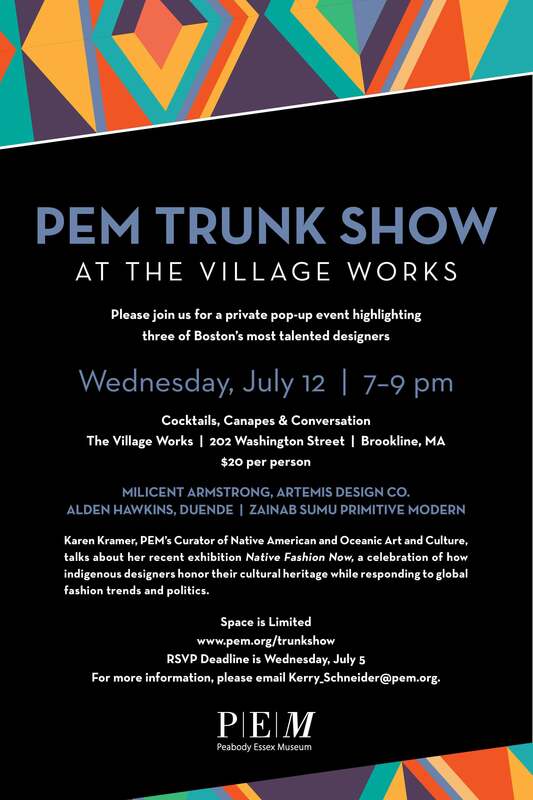 At this event, PEM Trunk Show at The Village Works, a group of 70 gathered on July 12 to meet three of Boston’s most talented designers — Milicent Armstrong of Artemis Design Co., Alden Hawkins of DUENDE and Zainab Sumu Primitive Modern. Karen Kramer, PEM’s Curator of Native American and Oceanic Art spoke about her 2015 groundbreaking exhibition Native Fashion Now. This first exhibition of its kind, Native Fashion Now celebrated how indigenous designers honor their cultural heritage while responding to global fashion trends and politics. Linking fabric as an expression of identity, her remarks deepened our understanding of the three featured artists at the event who all work with fabrics from around the world. "Native American art and culture are often perceived as phenomena of the past - or just mere replicas. But that couldn't be further from the truth," Kramer said. “Contemporary Native fashion designers are dismantling and upending familiar motifs, adopting new forms of expression and materials, and sharing their vision of Native culture and design with a global audience." She then went on to describe the sections of the exhibition, pointed out the beautiful exhibition catalog given away that night, and video piece on loop in the downstairs event space featuring designers featured in Native Fashion Now. 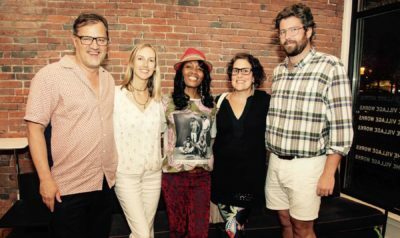 Trevor Smith, Curator of the Present Tense, Milicent Armstrong, Zainab Sumu, Karen Kramer, Curator of Native American and Oceanic Art and Alden Hawkins gather together at the end of the trunk show. Milicent Armstrong of Artemis Co. Milicent Armstrong is an award-winning American designer, best known for her lifestyle label, Artemis Design Co. The collection utilizes vintage materials for charming, comfort-forward, one-of-a-kind footwear and handbags in classic shapes that has garnered a cult following amongst world renowned Interior Designers and Magazine Editors, such as Nate Berkus, Jeremiah Brent, Charlotte Moss and Nick Sullivan. Grown from Armstrong’s South End apartment, Artemis has created limited-run collections for the likes of Steven Alan, Anthropologie, Of a Kind, and United Arrows of Japan. 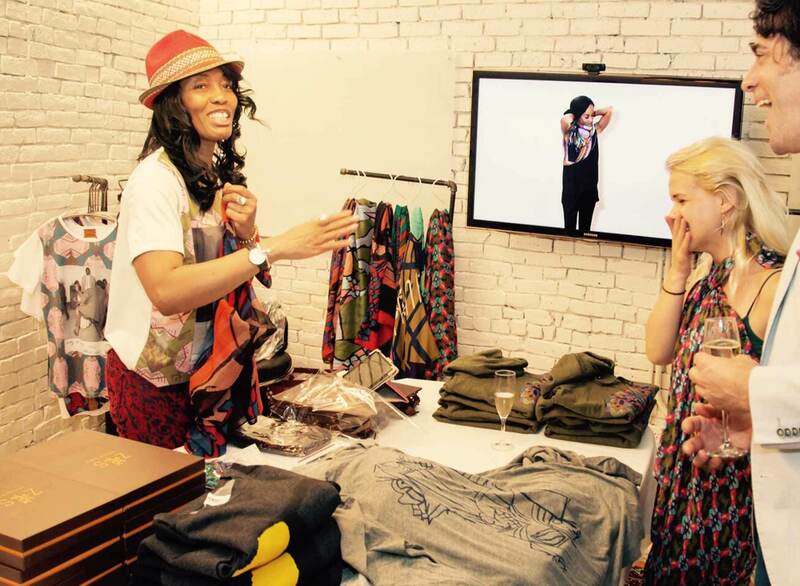 Armstrong was named a “most promising up and coming American Designer” in Racked’s 2015 Young Guns Awards and won across three fashion categories in Boston Magazine’s annual Best of Boston Awards in 2015, 2016 and 2017. 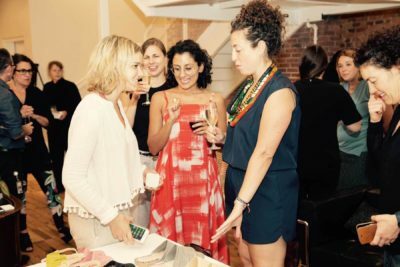 Her designs have gotten the attention of publications such as the Wall Street Journal, the Boston Globe, Town and Country, and Esquire, among others. 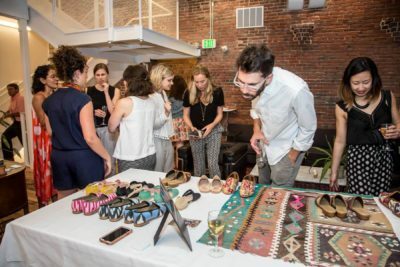 John Hemminger, a web designer for culturaliv.com, looks closely at the Artemis Co. hand crafted shoes made from Turkish kilim carpets. Alden Hawkins of DUENDE and Milicent Armstrong of Artemis Co. pause to smile before the event begins. 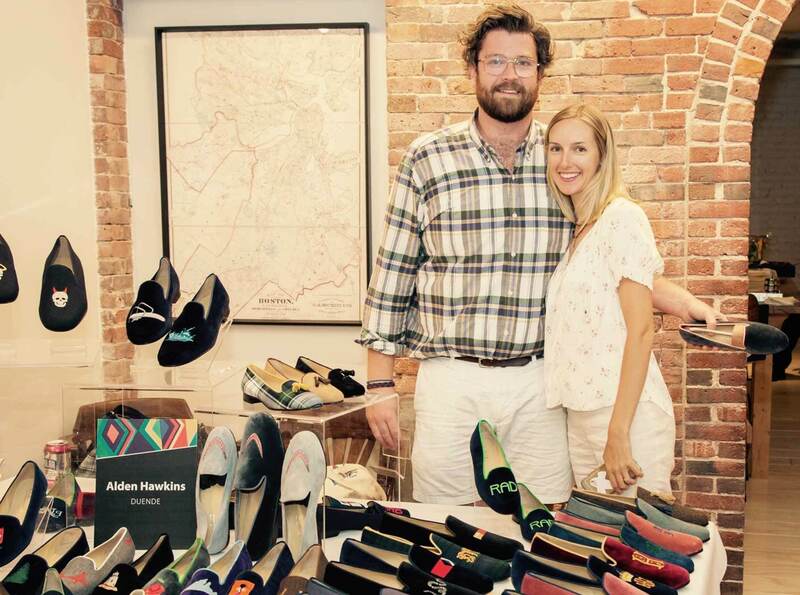 Alden Hawkins launched DUENDE in 2015 to offer a range of exquisite men’s and women’s loafers. He is sought after around the country as the go-to designer of bespoke tuxedo slippers, loafers and weekenders. His custom options range from embroidery motifs and monogramming to the more classic horse bit and tasseled loafers. He frequently books trunk shows in Nantucket and Maine. Zainab Sumu Primitive Modern is a lifestyle brand comprising apparel and accessories inspired by indigenous cultures and traditions. Zainab combines indigenous and avant-garde elements to showcase the beauty, diversity and richness of West and North African cultures. Each year she chooses a country and creates a theme for her designs based on the unique culture, colors and architecture of that country. Her work has gained wide acclaim and recently Alicia Keyes has been wearing her work while performing and in selfies on Instagram. PEM staff circulated at the event with pins that said “Ask me about We Wear Culture”, a recently launched Google Arts & Culture's global fashion initiative. PEM has its own online exhibit Fashion Is a Verb: Experiencing Creativity and Design at PEM. We thank everyone who attended and supported these local artists and learned more about the cutting edge exhibitions PEM delivers. For more information about future pop-up events for the next generation of PEM supporters, please contact me at Kerry_Schneider@pem.org.